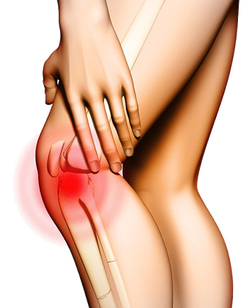 Hip and knee pain can have several causes, some of the most common are joint/cartilage damage, arthritis, misalignment, and several others. Rockin'Feet’s arch support and cushioning can help relieve pain in many cases, like when the pain is on the inside/outside/front/back of the knees/hips. When the foot supinates (walking on the outside of the heel) this puts pressure on the outside or the inside of the knee, depending on the severity of the supination. This pain can be excruciating and constant. The pressure of Rockin'Feet’s arch support in the middle of the foot helps to gradually put the foot in the neutral position so the foot neither supinates or pronates. This action in turn causes a realignment starting with the foot to the knee and up to the hip relieving pressure on the joint. Additionally, the Rockin'Feet cushioning provides shock absorption which also helps to reduce pain in the knees and hips.